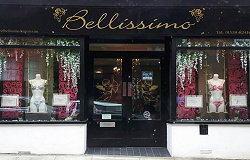 Since opening in 2007, Bellissimo has established itself as a destination for discerning ladies in search of perfect fitting lingerie displayed in exquisite surroundings coupled with exceptional customer service provided by owner Alison and her staff. Whether you are looking for lingerie, swimwear or nightwear for everyday, occasion, bridal, maternity or mastectomy Bellissimo has something to suit ladies of all ages. We stock ranges by Marie Jo, Prima Donna, Lejaby, Elixir de Lingerie, Fauve, Freya, Fantasie, Triumph, Lou, Elle MacPherson Intimates and many others – in sizes A to K cup. A professional fitting service is available to ensure a perfect fit every time. Opening Hours: Monday to Saturday – 10.00am to 5.00 pm. Also open by appointment.